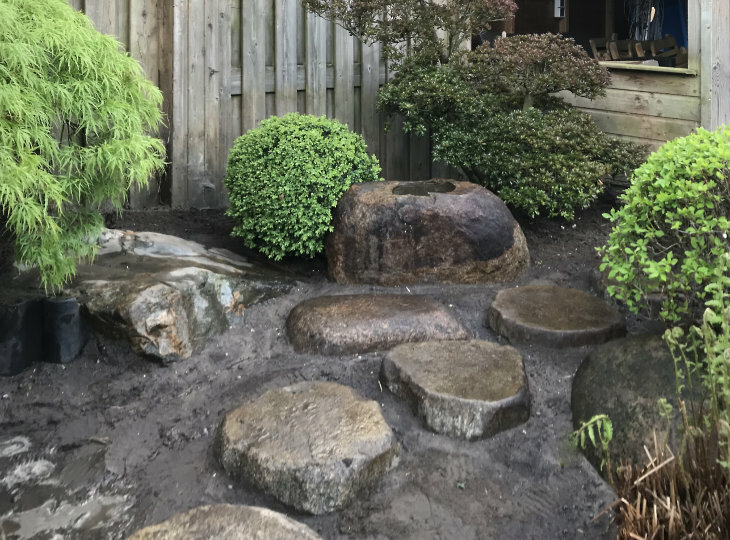 Phased restyling of a small courtyard in Deventer, The Netherlands. 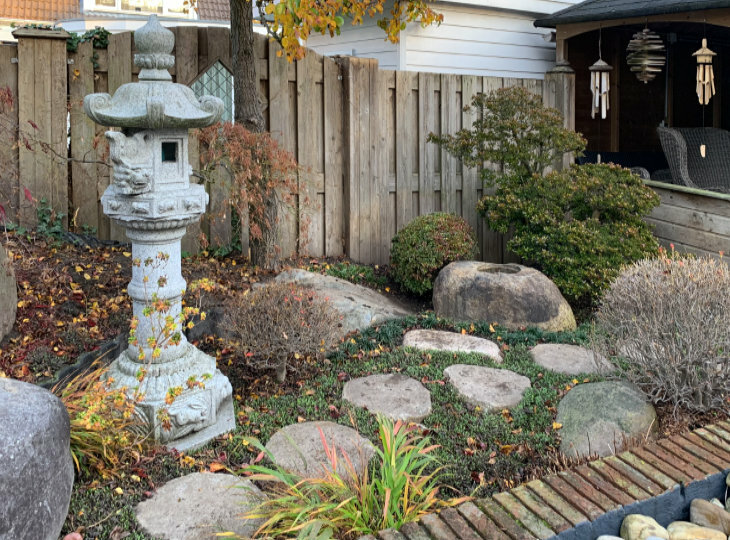 This small courtyard garden already had some Japanese influences, including a richly decorated Kasuga lantern. 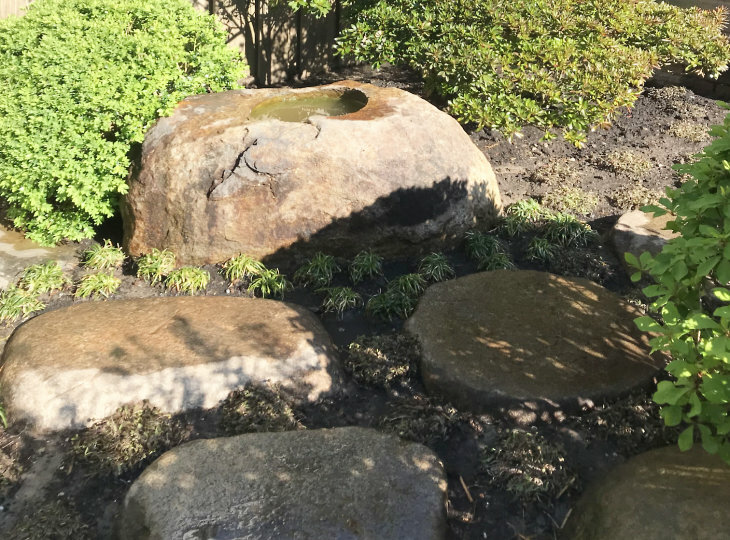 In the garden a large koi pond was been built around which small pieces of Japanese garden have been laid out. 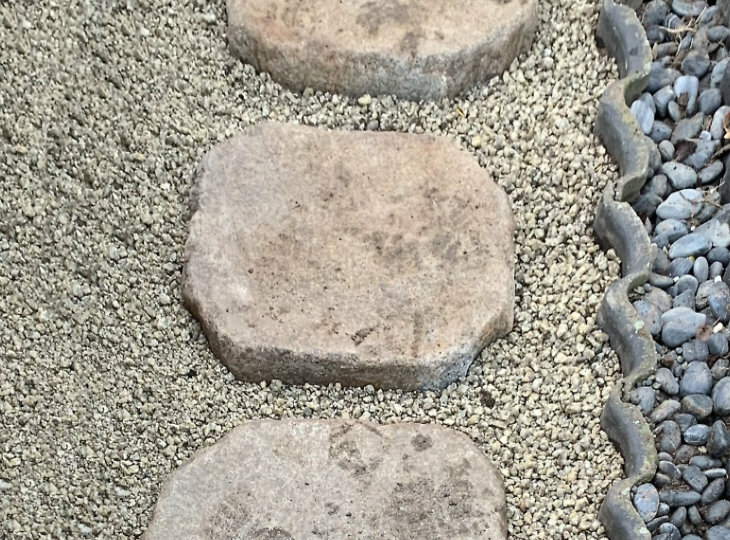 For the restyling the old black gravel has been removed and replaced by the original Japanese Shirakawa gravel. 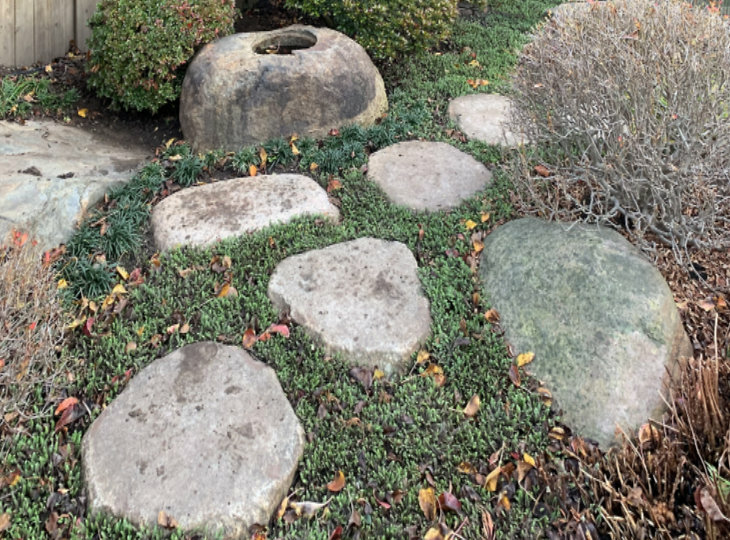 In the gravel is a stepping stone path, in Japanese 'Tobi-ishi' laid out by means of Kuruma Stepping stones from an old Japanese garden in Nagoya. 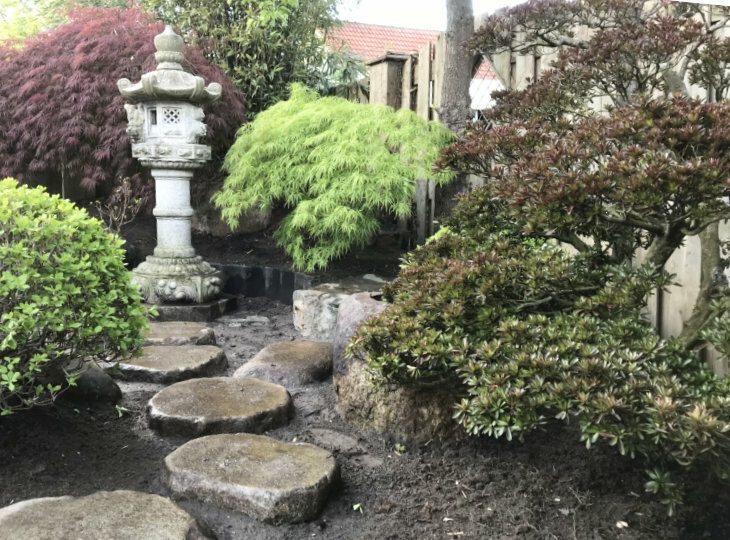 The separation between the border and the gravel is built up by means of vertically placed old Japanese roof tiles, creating a interesting pattern. 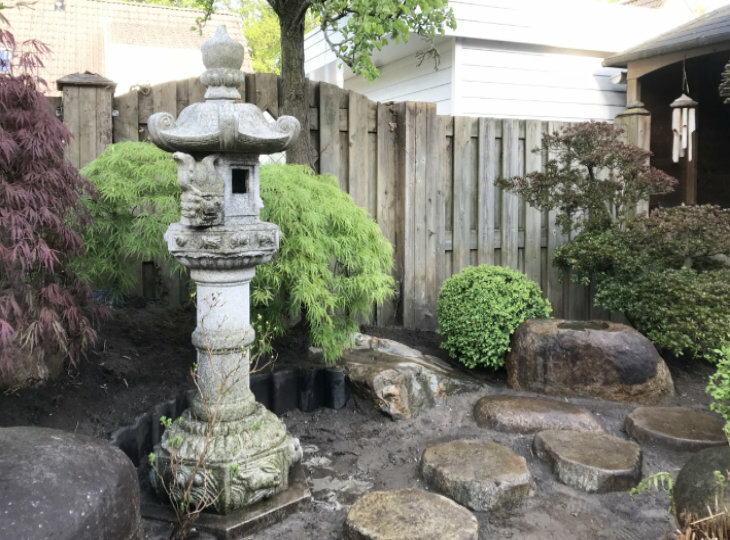 The old black gravel was also removed in the raised part of the garden behind the koi pond. 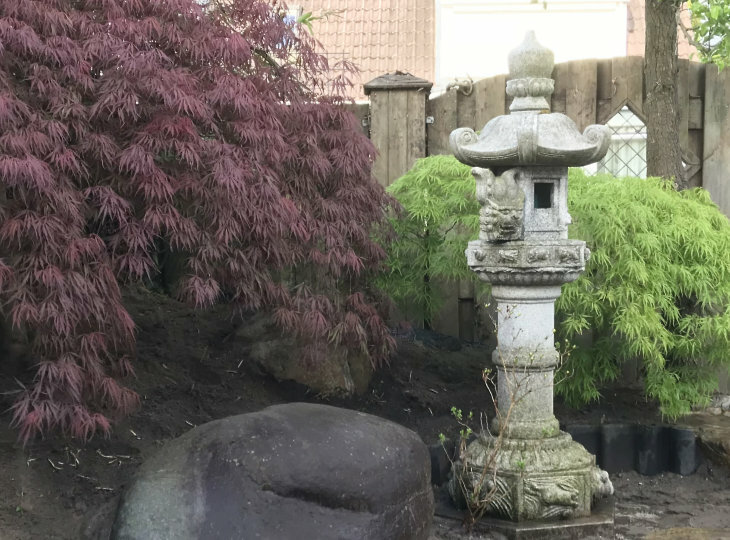 The existing Kasuga lantern was moved to a better position in the garden. 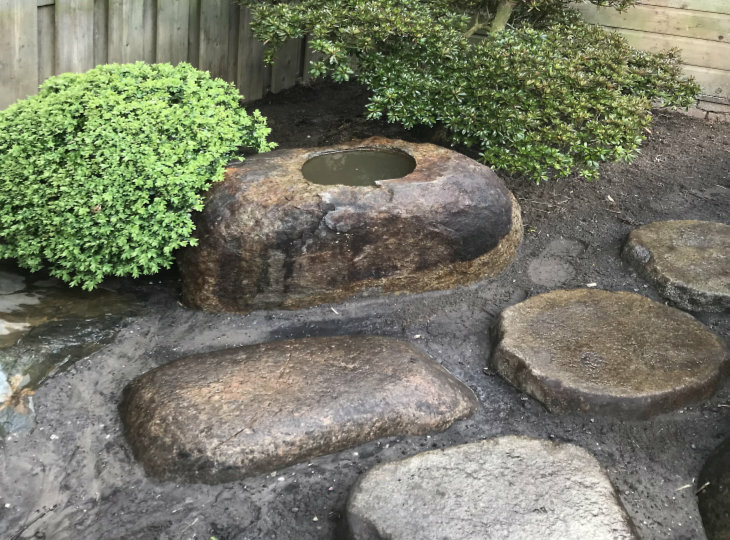 A beautiful old Kurama tsukubai was placed. 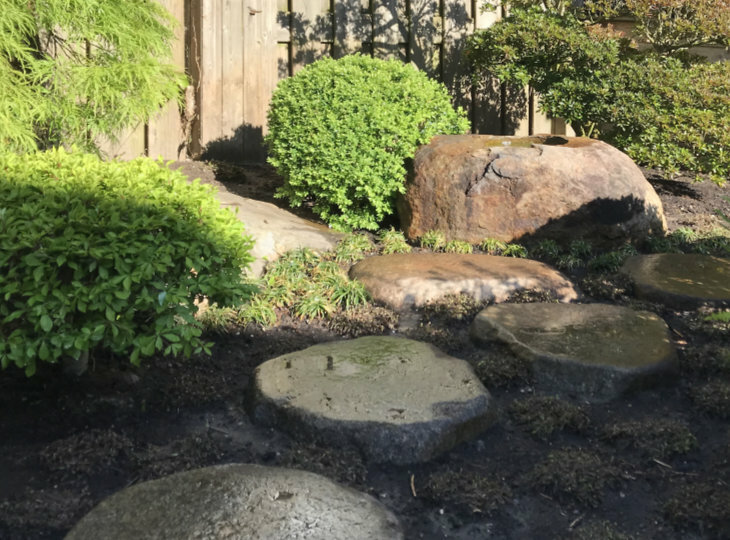 This part of the garden was equipped with granite stepping stones. 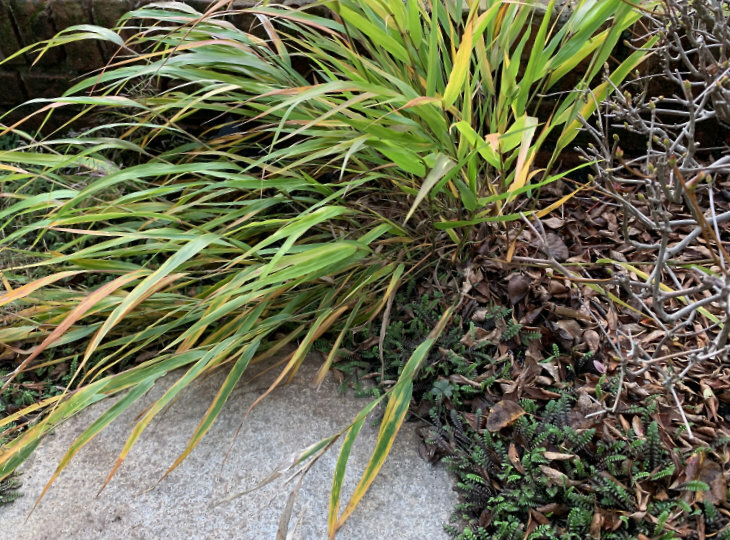 This time not in combination with gravel but embedded in a combination of ground cover plants such as Ophiopogon and Leptinella. 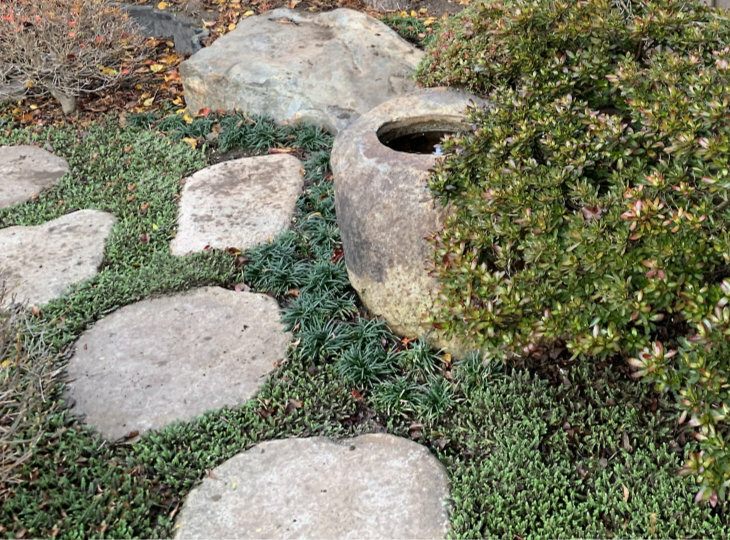 These ground cover plants are a great alternative for mosses that do not grow easily. 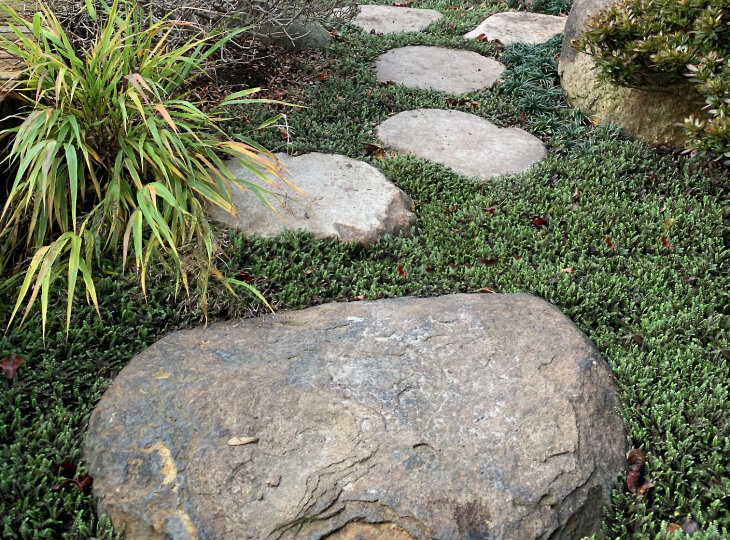 Especially Leptinella grows relatively quickly to form a dense green 'carpet'. 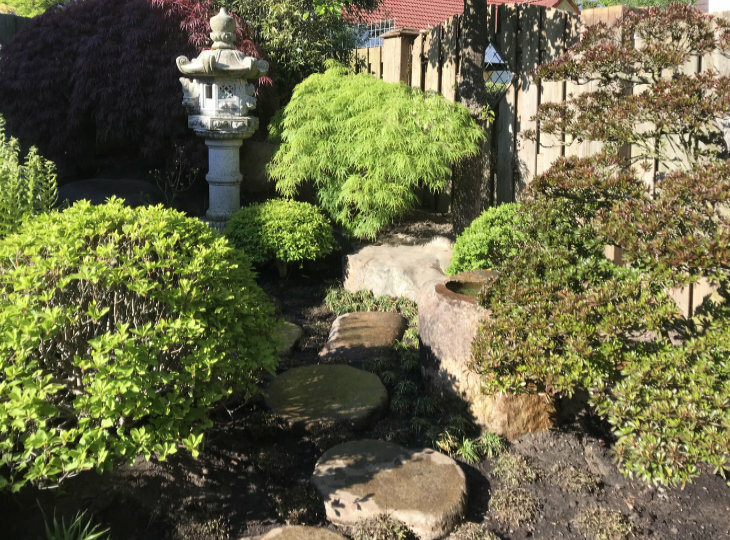 The existing planting has been supplemented with a Japanese Azalea form tree, Japanese Enkianthus, and Azalea bulbs, ground cover plants and accent plants such as Hakonechloa, Japanese forest grass. 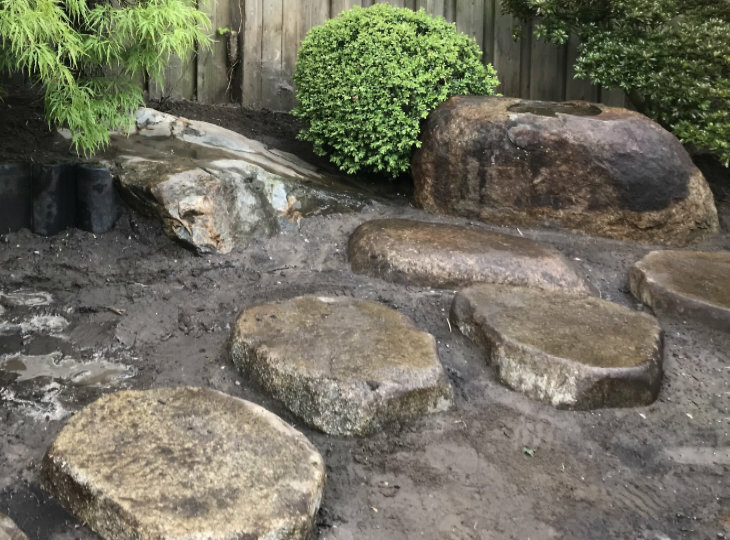 In the next phase, next to the stepping stone path, a form tree, Japanese white pine, will be placed to complete the garden.